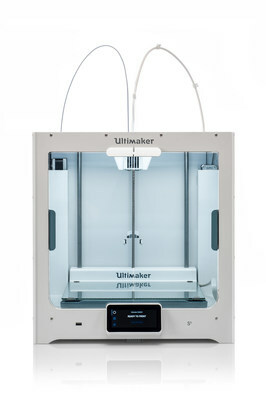 The Ultimaker S5 has fully integrated hardware, software and materials configuration, as well as optimal settings alignment, designed for professional users that require full geometrical freedom capabilities, industrial-grade material properties, repeatability, high uptime and an integrated workflow. Boasting an optimized touch screen for better user experience, it features a 330x240x300 mm build volume for printing larger objects, dual extrusion, and an improved feeder system with a filament flow sensor that auto pauses and resumes when materials run out-leaving print quality untouched. The enhanced bed leveling ensures a perfect first layer and continuously compensates the print bed while printing, which allows unattended use of the Ultimaker S5. The Ultimaker S5 unlocks new applications and can print with a wider range of materials, from PLA to advanced engineering plastics like Nylon and PC. The Ultimaker S5 includes a closed front system, and from fall 2018, an anodized build plate. A full overview of specs can be found here . Ultimaker Tough PLA – A technical PLA filament optimized for printing models at larger sizes such as functional prototyping, tooling and manufacturing aids, with no delamination or warping. With an impact strength similar and higher stiffness compared to Ultimaker ABS, Tough PLA is less brittle than regular PLA and gives a more matte surface finish quality. The Ultimaker S5 and Ultimaker Tough PLA will be available on May 15, 2018 through Ultimaker’s network of global partners. For more information, please visit http://www.ultimaker.com or read our blog. 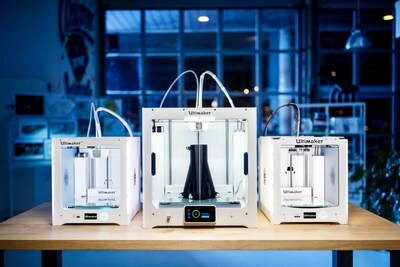 Ultimaker has been in operation since 2011, and over the years has grown to become a market-leader; creating powerful, professional and accessible desktop 3D printers with offices in the Netherlands, New York, and Boston, plus production facilities in Europe and the US. Ultimaker’s team of over 300 employees continually strives to offer the highest-quality 3D printers, software, and materials on the market to accelerate the world’s transition to local digital manufacturing.